The Lightning look to wrap up the Eastern Conference Finals against the Penguins in game six. After being down 2-1 to the Pittsburgh Penguins in the Eastern Conference Finals, the Tampa Bay Lightning have won two straight games to lead the series 3-2. The Lightning are one win away from returning to the Stanley Cup Final for the second straight season. Game Six is Tuesday night in Tampa Bay. The Penguins look to force a game seven Thursday night in Pittsburgh. Tampa Bay won game one 3-1 in Pittsburgh, despite losing goalie Ben Bishop to a knee injury in game one. Bishop hasn’t played since and has been replaced by Andrei Vasilevskiy. Bishop is listed as doubtful for game six. Pittsburgh won game two at home 3-2 in overtime and game three 4-2 in Tampa Bay. 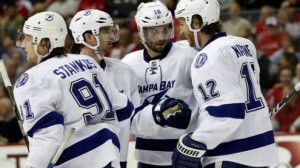 The Lightning evened the series with a 4-3 victory in game four. The Lightning won game five Sunday night in Pittsburgh 4-3 in overtime. In game five, Pittsburgh benched rookie goalie Matt Murray in favor of veteran Marc Andre-Fleury. Fleury hadn’t started since suffering a concussion in March, but did come in relief of Murray in game four. Murray will start game six though. The Penguins scored first with just a second left in the first period on a goal from Brian Dumoulin. Pittsburgh added another goal a minute into the second from Patric Hornqvist to take a 2-0 lead. Tampa Bay would score the next two goals a minute a apart on goals from Alex Killorn and Nikita Kucherov. The Penguins regained the lead with less than a minute left in the second on a goal from Chris Kunitz. Tampa appeared to score the game tying goal with around five minutes left in the third but replays showed the puck hit the post and skimmed along the goal line but never into the net. Kucherov did tie the game with just over three minutes left in the period. In overtime, Tyler Jonson scored the game winner for the Lightning just 53 seconds into the extra period. Pittsburgh had 34 shots to 25 for Tampa Bay. The Penguins won 37 faceoffs to 31 for the Lightning. Both teams were 0/3 on the power play. Vasilevskiy made 31/34 saves. Fleury made 21 of 25 saves. Pittsburgh is coached by Mike Sullivan. The Penguins finished second in the Metropolitan Division with 104 points. Pittsburgh dominated the New York Rangers in 5 games in the first round. The Penguins outscored the Rangers 21-10 in the series. Pittsburgh upset the Washington Capitals in six games in the second round. Five of the six games were decided by one goal including 3 overtime games. Pittsburgh is 58-32-4-4 this season and the total is 44-36-18 this season. Tampa Bay is coached by Jon Cooper. The Lightning finished second in the Atlantic Division with 97 points behind the Panthers who had 103 points. The defending Eastern Conference champion dispatched the Detroit Red Wings in five games in the first round. The Lightning lost game one against the New York Islanders but then won four straight games to return to the Eastern Conference Finals. Tampa Bay is 58-33-2-3 and the total is 40-44-14 this season. Pittsburgh is outscoring teams 3.19-2.50 in the playoffs. The Penguins average 34.9 shots per game and opponents average 30.4 per game. Pittsburgh is 14/56 (25%) on the power play in the playoffs and 44/53 (83%) on the penalty kill. The Penguins have one short handed goal and has allowed one as well. Pittsburgh goalie Marc-Andre Fleury missed the first two rounds with a concussion. Murray is 9-4 in the playoffs with a 2.33 goals against average. He has made 360 of 390 saves (.923) with one shutout. Fleury is 0-1 with a 3.03 GAA. He has made 28/32 saves (.875). Jeff Zatkoff is 1-1 with a 3.07 GAA. He has made 59/65 saves (.908). Zatkoff played in two games in the first round. Phil Kessel has 17 points with nine assists. Center Sidney Crosby has 13 points in the playoffs including 8 assists. Nick Bonino has 13 points with 11 assists. Carl Hagelin has 12 points with 7 assists. Evgeni Malkin has 12 points with 8 assists. Patric Hornqvist has 10 points with 7 goals in the playoffs. Kris Letang has 9 points with 8 assists. Six other players have at least 5 points in the playoffs. Left wing Scott Wilson and center Kevin Porter are both out indefinitely. Defenseman Trevor Daley is out for the season with a broken ankle. Tampa Bay is outscoring teams 3.00-2.20 this season. The Lightning average 28.4 shots per game and opponents average 32.9 per game. Tampa Bay is 9/53 (17%) on the power play and 51/59 (86.4%) on the penalty kill. The Lightning have not scored or allowed a short handed goal. Bishop is 8-2 in the playoffs with a 1.85 GAA. He has made 279/297 (.939) saves with two shutouts. Andrei Vasilevskiy is 3-2 and has a GAA of 2.65. He has made 181/195 saves (.928). Nikita Kucherov has 19 points with 11 goals. Tyler Johnson has 17 points with 10 assists. Victor Hedman has 13 points with 9 assists. Alex Killorn has 13 points with 5 goals. Jonathan Drouin has 12 points with eight assists. Ondrej Palat has 10 points with 6 assists. Three other players have at least 6 points. Center Steven Stamkos is out indefinitely with an arm injury. Defenseman Mattias Ohlund is out indefinitely with a knee injury. Pittsburgh is 5-0 in Tuesday games, 24-7 on one day rest, 14-4 in road games, 19-7 against teams with winning records, 37-16 overall, 36-17 against Eastern Conference teams, and 2-7 in conference final games. The over is 20-4-3 in this series including 5-0 in Tampa Bay. Tampa Bay is 5-1 after a win and on one day rest, 7-2 against Metropolitan teams, overall, against teams with winning records, and against Eastern Conference teams, 67-32 at home and 2-5 against teams with winning road records. The Lightning are 6-2 against the Penguins recently including 4-1 at home. Game five was a devastating loss for the Penguins. They had a 2 goal lead and even led with less than four minutes to go in the game. It will be very difficult but not impossible to force a game seven. The Penguins certainly have the talent to do so, and I think they win a close game on the road.